Decided to pay these a visit while on my way to a Sage Chapel wedding. Also, to prove to myself that I could take pleasant-looking photos of this complex. 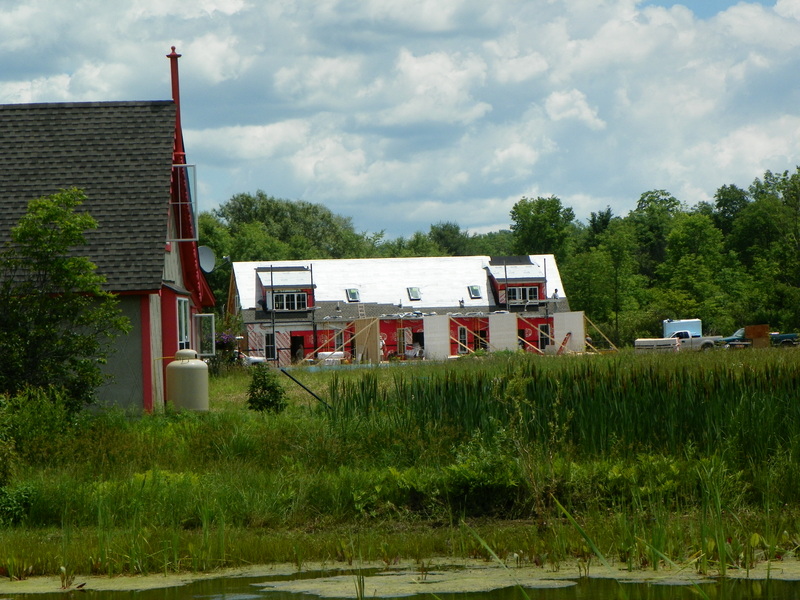 Several buildings were underway, and two were a new style – five-unit gatehouse structures. 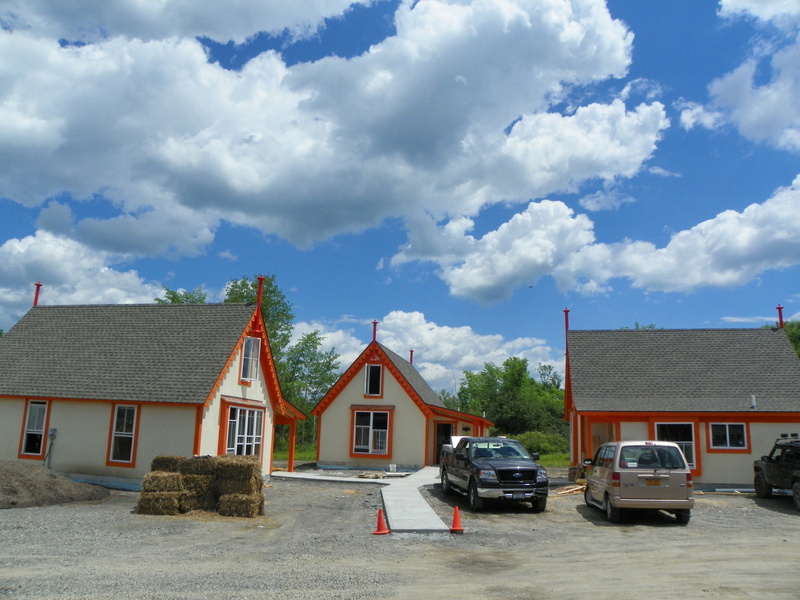 They appear similar to the three-unit gatehouse structures already built, but the first hint that these were different comes from the dormers being positioned further out. 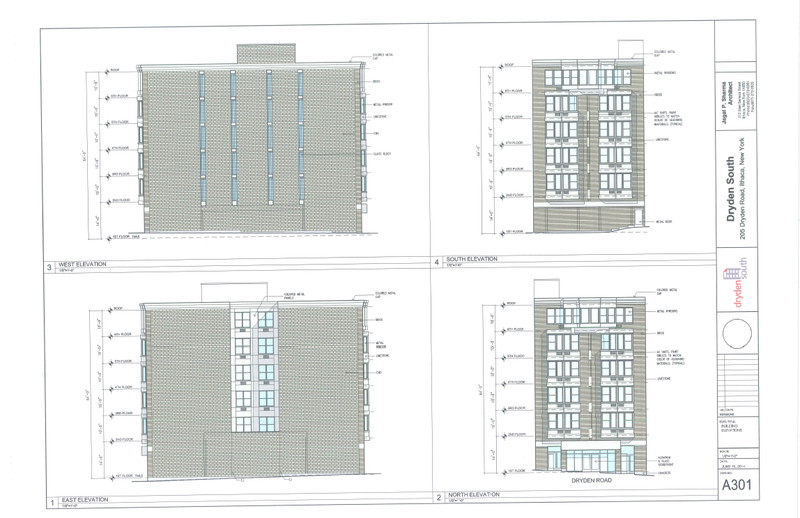 My guess would be they they are one-bedroom units on the end and studios in the middle three units. 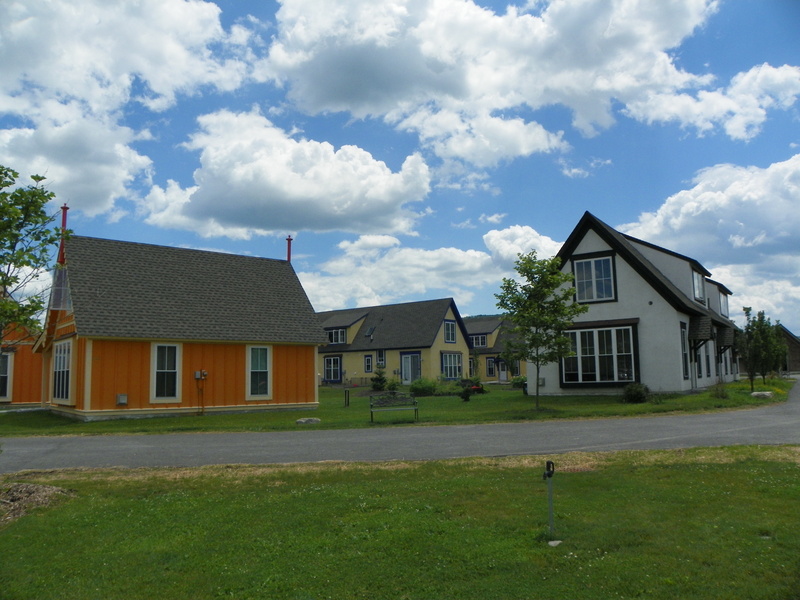 A set of three houses, the ones with the orange trim below, appeared to be in the last stages of construction. 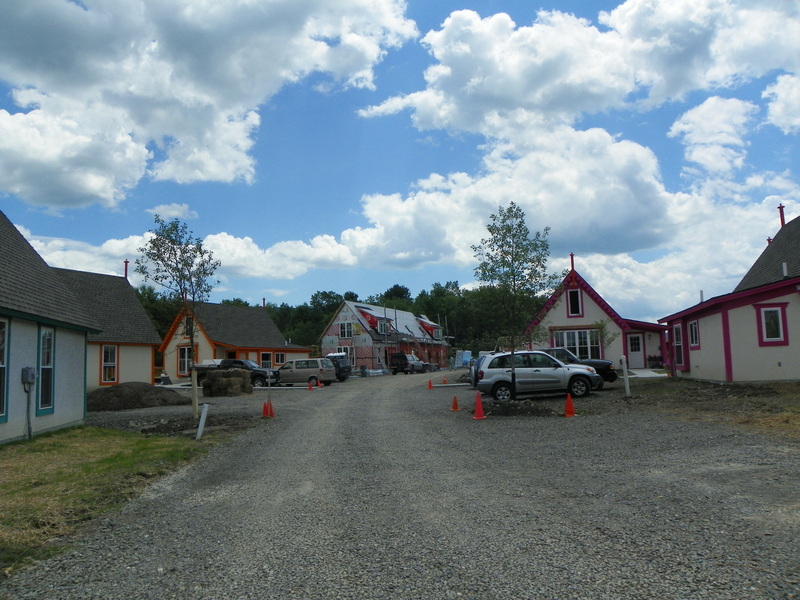 The pink-trimmed and blue-trimmed homes next to them have only just received landscaping, and appear to have tenants. 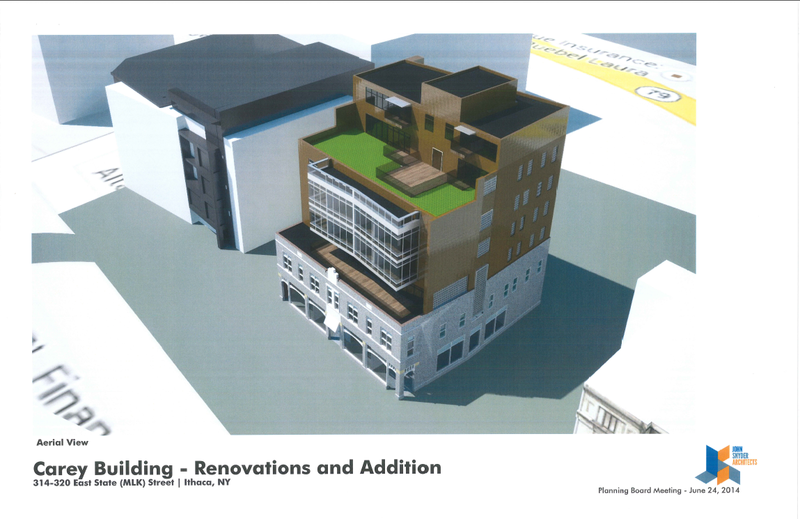 Okay, so technically, the previous renders shown on this blog were massing studies for the addition proposed for the Carey Building. The newly-released design is here. The design comes courtesy of local firm John Snyder Architects, working with local development firm Travis Hyde Properties. Based off the attached floor plans, it looks like there will be 18 apartments, 16 studios (most in the 250-350 SF range), and 2 2-bedrooms. 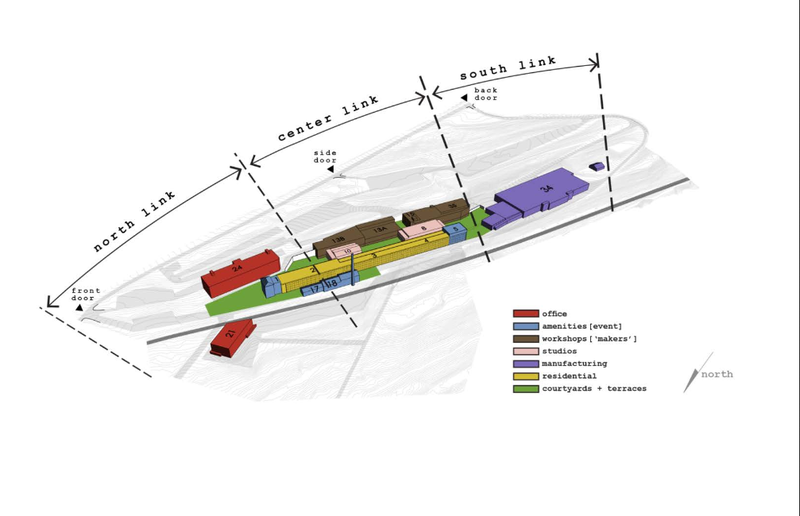 Floors 4 and 5 will have 7 studios each, and 6 and 7 will have one studio and one 2-bedroom each. The “micro-apartments” are definitely small but will allow for more modest rents, tapping into some of the need for affordable housing in the city. Cover letter with brief description here, renders and site photos here. 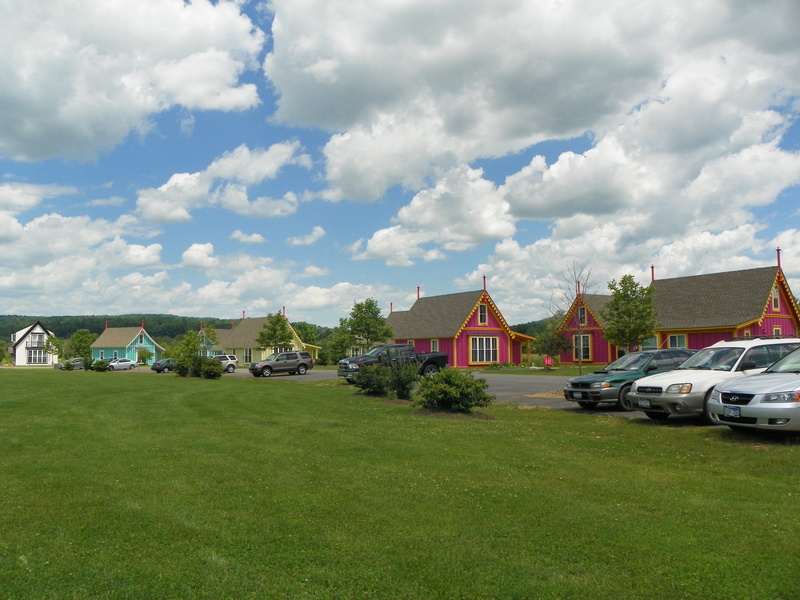 The site is currently home to the “Fontana Apartments”, although Cornell students might better recognize it as the home of Club Sudz and Pixel in the rear. The Fontanas are famous for their 107-year old shoe store, they’ve been long-time landlords on Eddy street and developed the apartment buildings north of the site in 1985/86. The project would tear Club Sudz and Pixel down and replace them with a 28-unit, 64-bedroom building, designed by local firm Jagat Sharma (which I have no problems with, but seeing as Sharma Architecture has designed almost every large building in Collegetown, including the two on the left in the rendering, I would love to see something different). 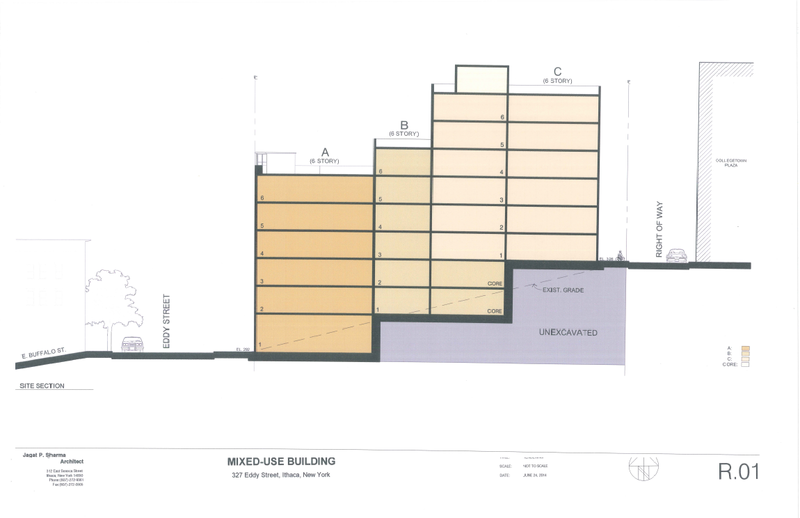 Retail space will be on the first floor, which is required in the Collegetown MU-2 zone. 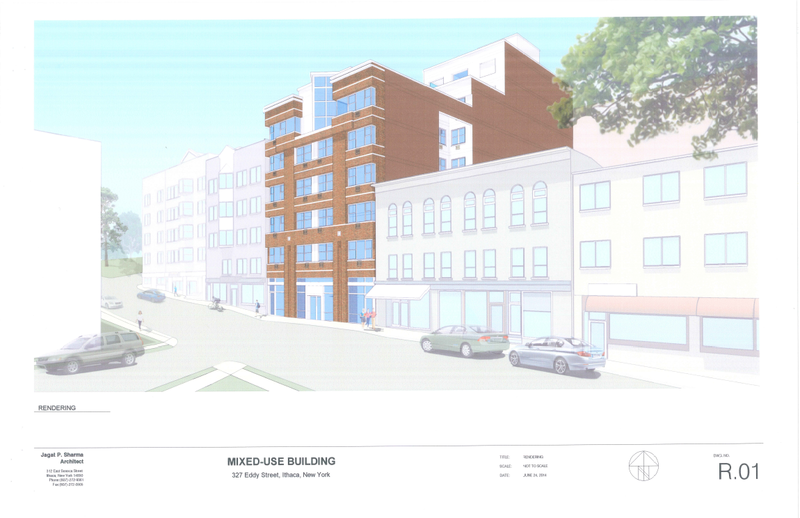 MU-2 also has no parking requirements – we’re following a theme here with the MU properties; now that the parking requirement is gone, it’s been nothing short a development bonanza. The building is six floors – things look a little weird because it’s built on a hill, and it steps back. I wouldn’t begrudge a passerby on Eddy for thinking it’s nine floors. 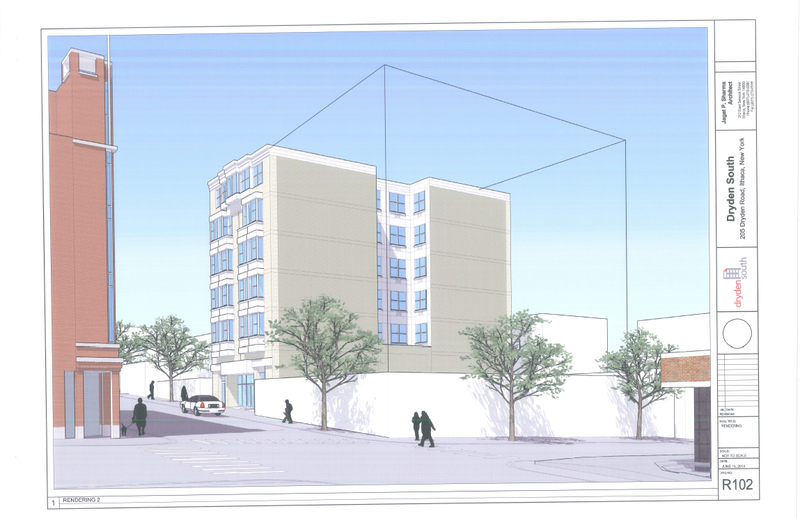 It’s just a sketch plan, but given the size, it would not be off to suggest that the developers want this building to welcome its first tenants in August 2015, assuming approvals are granted this summer. 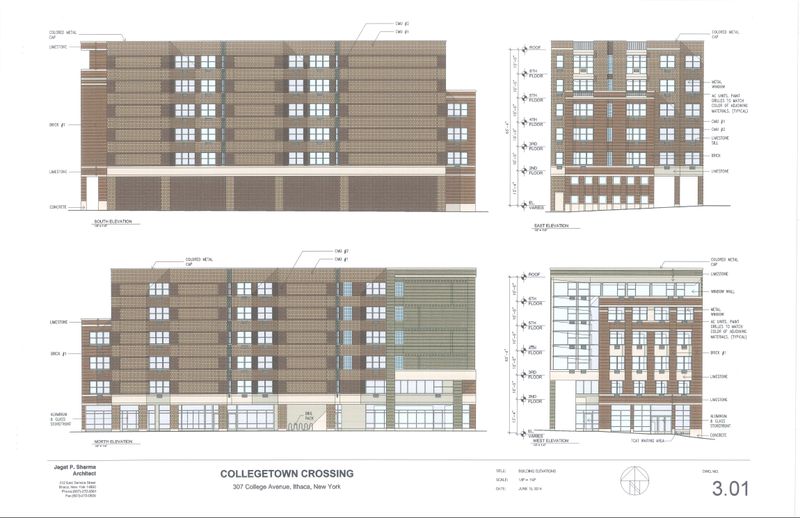 If approved, that would mean 5 projects would be underway in Collegetown next spring, with 223 bedrooms. I’m certain there will be more proposals for inner Collegetown in the meanwhile. In previous years, the blog averaged 82, 166, 199, 216 and 182 hits daily. At this time last year, I was actually pretty concerned about the drop in traffic, thinking that the blog’s best days were behind it, and it would just be a slow decline until I finally gave up the ghost. Before taking that drastic step, I figured I’d change up tactics first. For one, the twitter account was started on February 2nd; I try to keep many of the twitter posts unique, so that followers aren’t just getting rehash of the blog. About 500 hits have been from twitter (the vast majority from the Ithacating account), which accounts for about 2% of the blog visits over that Feb-Jun period – not enormous, but notable. After search engines and facebook, it’s the third largest source of visitors. I also started to leave links to other entries in posts, a practice I had shunned for years as a form of shameless self-promotion. I came to realize that, for easy info access, convenience outweighed modesty. However, I firmly maintain no one will ever see links to this blog on my personal Facebook or LinkedIn accounts. Second, I decided to borrow methods from Ithaca Builds; in some ways, Jason was the kick in the rear this blog needed to get back on its game. A daily check of city document uploads allow this blog to be among the first, if not the first, to report on new proposals and developments, and when I get around to a photo tour every few months, I break them up into individual projects – much less photo lag, and a steadier flow of entries. The old maps I did for a couple older entries were also “retired”, seeing as the HTML version on IB is much more useful. Jason has his strengths, and I have mine; I like to think we’ve both found respectively niches that complement the other writer’s work. Another small detail is seen here – many blog posts are now written in advance and scheduled. I wrote this two days ago, leaving out the actual numbers until today. Over the years, the content of this blog has also evolved quite a bit. 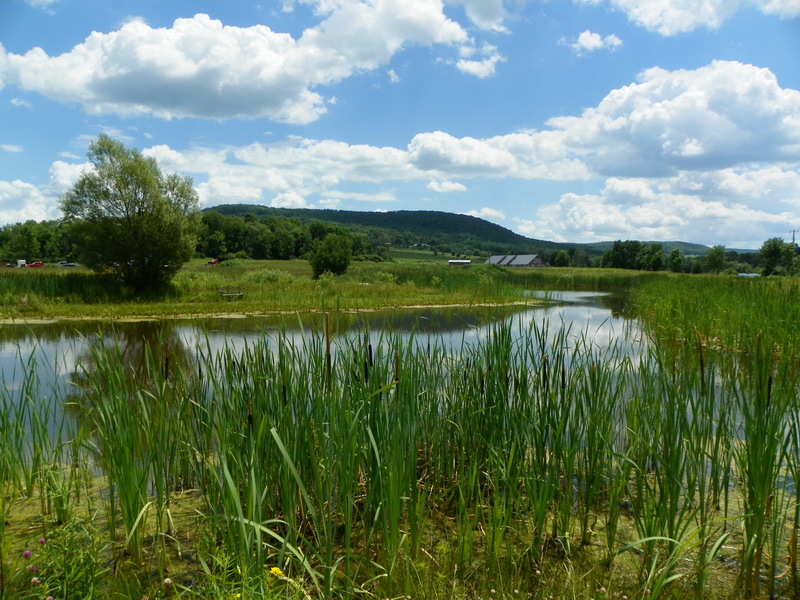 At the start, it was largely Cornell, Cornell facilities and Cornell history. However, I eventually started to work my way through most of those topics, and ideas became fewer and further between. 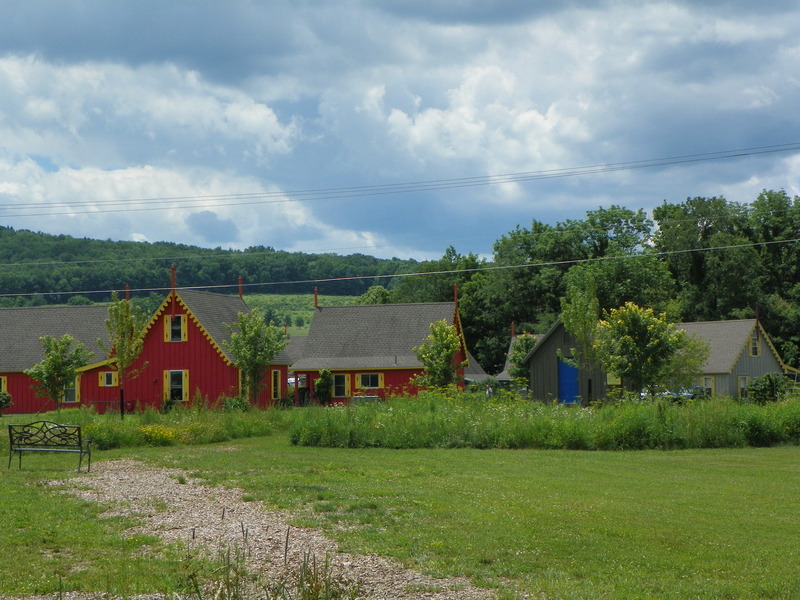 The Ithaca development entries, which were a small portion in the beginning, began to take up a larger proportion of the topic matter. I don’t regret this move, but it definitely changed up traffic patterns and what visitors come to this blog for. If anything, it makes me feel a little self-conscious when I get emails or comments give me far more credit than I feel is due. 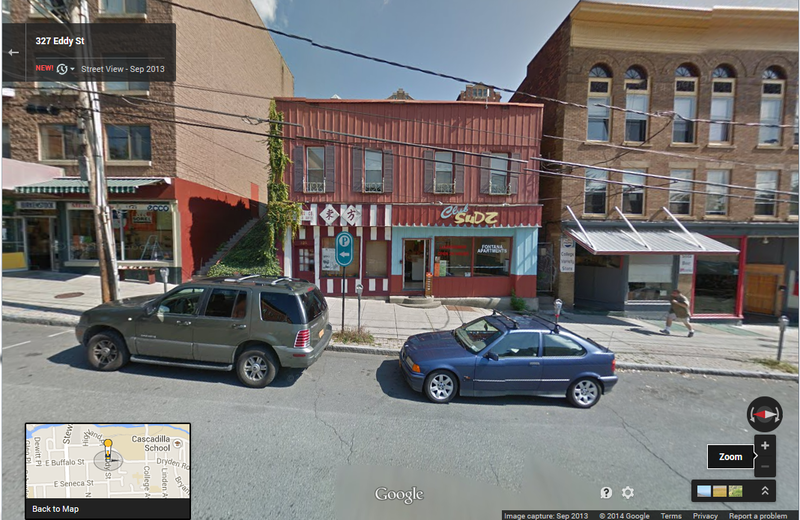 If I became an expert on Ithaca development and urban planning, it wasn’t my intention. I just prefer to not look like an idiot when I write something up. Anyway, the numbers: as of 3 PM today (note that the blog time is GMT), there have been 56,700 hits, a daily average of 155 hits over the past year. But, looking year to year by month since the big drop after January 2013, numbers are up 20-50%, a pattern that looks to continue this month. It took some work, but this blog is bouncing back. Looking over the past years, there have some Cornell-related posts, a topic near and dear to my fingers, if not my heart. Buildings named for “friends” of Cornell, Cornellians in the Olympics, and the “Fast Facts” entries. I sill do construction updates once in a while, though mostly I’ve left those to Jason’s domain. 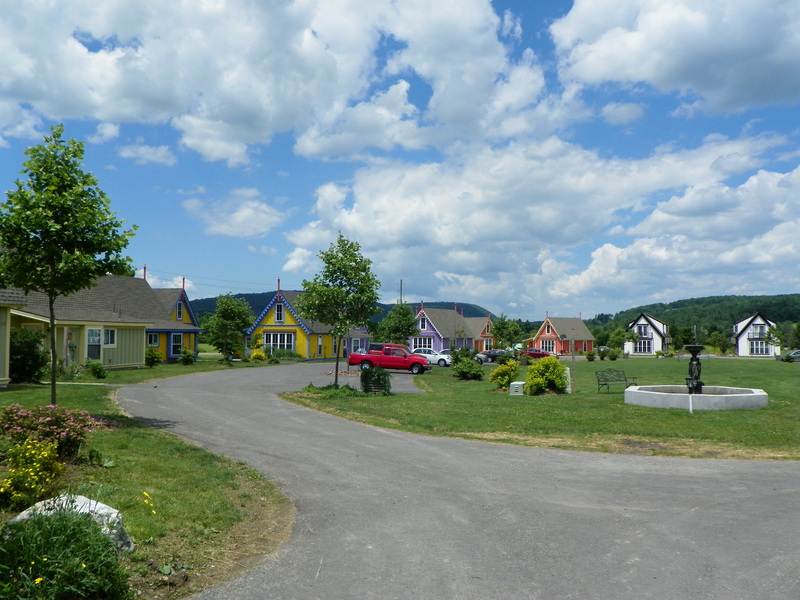 About the only ones I visit more often are the Belle Sherman Cottages and the Boiceville Cottages; I actually feel a little bad about the Boiceville updates, because I have the remarkable ability to make the place look unattractive every time I take photos, due to it always being grey or cold when I pass through. In the past year, Seneca Way finished up, the Argos Inn opened (and I hit up its bar), Collegetown Terrace continued construction, and Breckenridge welcomed its first renters. 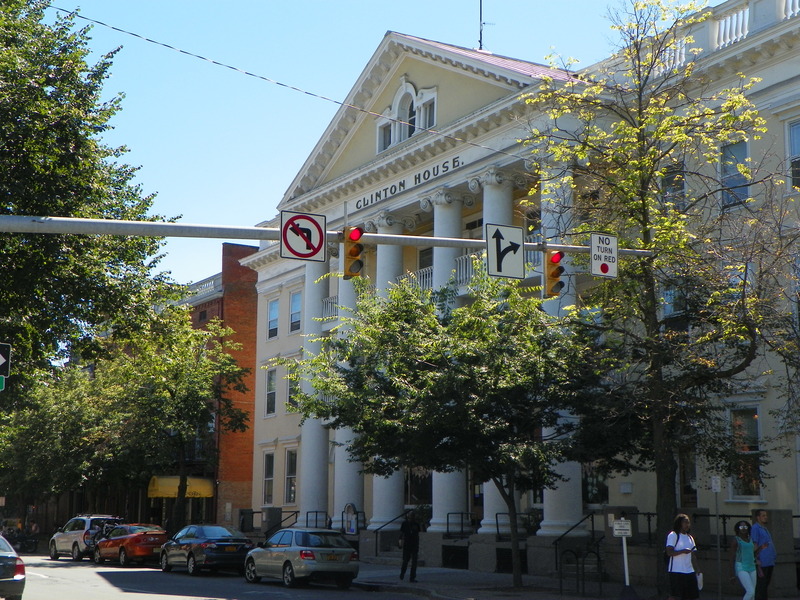 Harold’s Square received approval, the Marriott and Hotel Ithaca dragged along (but at least one has started and one is about to start). 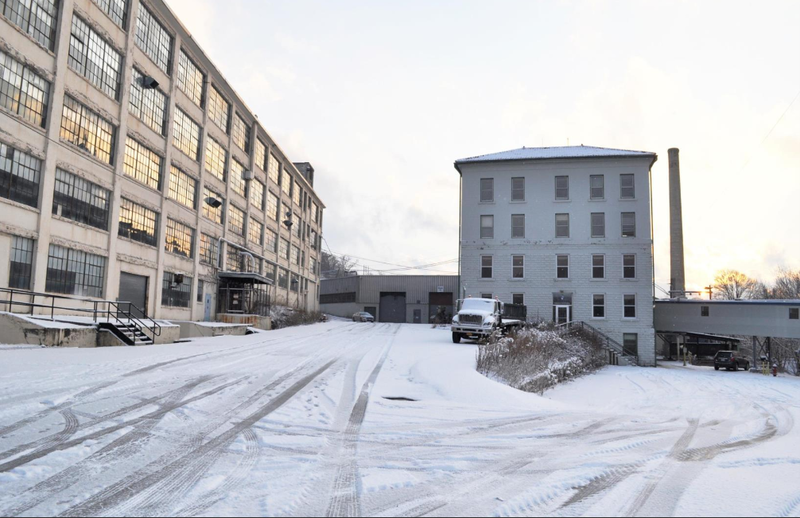 Many projects were announced, including hotels at 339 Elmira and 371 Elmira, a new apartment building for Collegetown, 323 Taughannock, the Chain Works District, and everyone and their grandmother wants to redevelop the old library. It’s been busy, and sometimes it’s hard to keep up, which I consider a good thing. History has taught me that not everything proposed will be built, but I’m optimistic much of it will, to the benefit of the city’s bottom line. 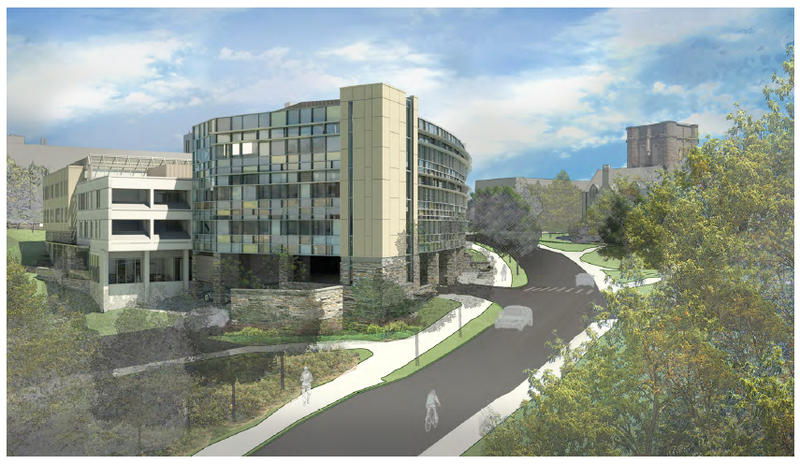 Over at Cornell, the Gannett addition was formally announced, the Statler planned yet another makeover, Gates Hall opened and the Dairy Bar reopened. Klarman Hall is underway and a new “Sesquicentennial Grove” is planned for Libe Slope. Lastly, I had my random topics, usually on the weather, the keyword bar, or my borderline obsession with 115 the Knoll. It’s occurred to me that I have never written a “birthday” entry in the same place. Last year, about a week after that post, I did an interview for an air quality scientist job in Albany; after having an attack of conscience and turning down a job in California in December 2012 (the pay was great, but if I was going to hate the work, it wasn’t worth the move), I had felt that I was stuck in a rut. A few days after that June 27th interview, I received a phone call at 1:55 PM on July 1st, extending to me a job offer. It was great, because I was working night shift as a ship router, and had been woken from my nap; the excitement was tempered by drowsiness. I put in my notice, moved up here in late July, and here I am. I don’t want to “settle” in one tier of one job for too long, but it’s not a bad place to be for the time being. In a way, these anniversary entries are a timestamp of my life, one of many things I’ve enjoyed in these years of writing. I hope to make more timestamps in years ahead. I figured I’d just bundle these projects together, since they all have minor tweaks or new details that should be noted, but wouldn’t need their own entries. 400 Spencer Street (Stone Quarry Apartments), 307 College Avenue (Collegetown Crossing) and 205 Dryden Road (Dryden South). First, the Stone Quarry Apartments. Letter documenting updates here, exterior materials and playground design here, revised drawings here. 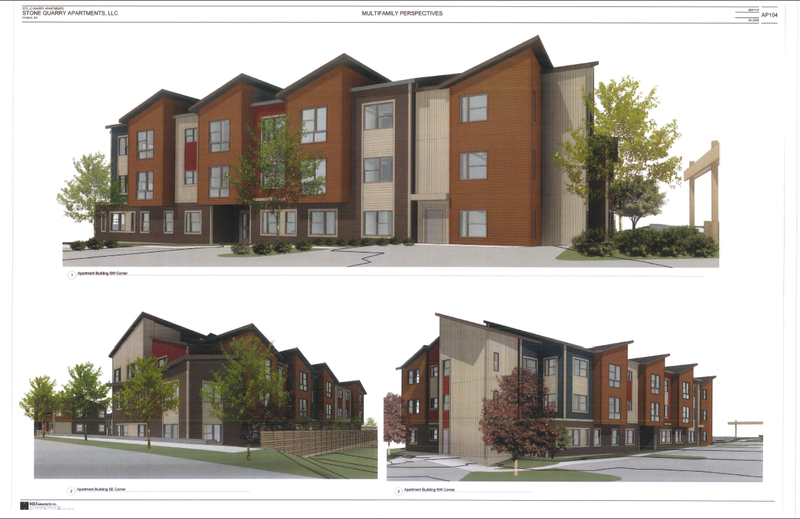 With six different siding colors planned, this 35-unit complex is going to be very colorful. 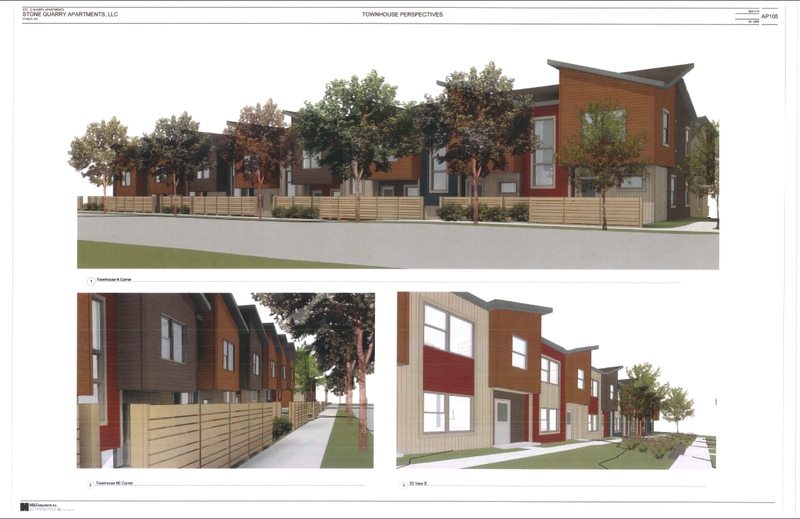 Since the renders last month, the 19-unit apartment building shows only minor changes, and the townhouses (2 sets of 8) have been reoriented to avoid that awkward break in the middle of the units that looked like a broken eave. As for Collegetown Crossing, the number of units and rooms has been tweaked again, to 46 units (from 43) and 96 bedrooms (from 98). 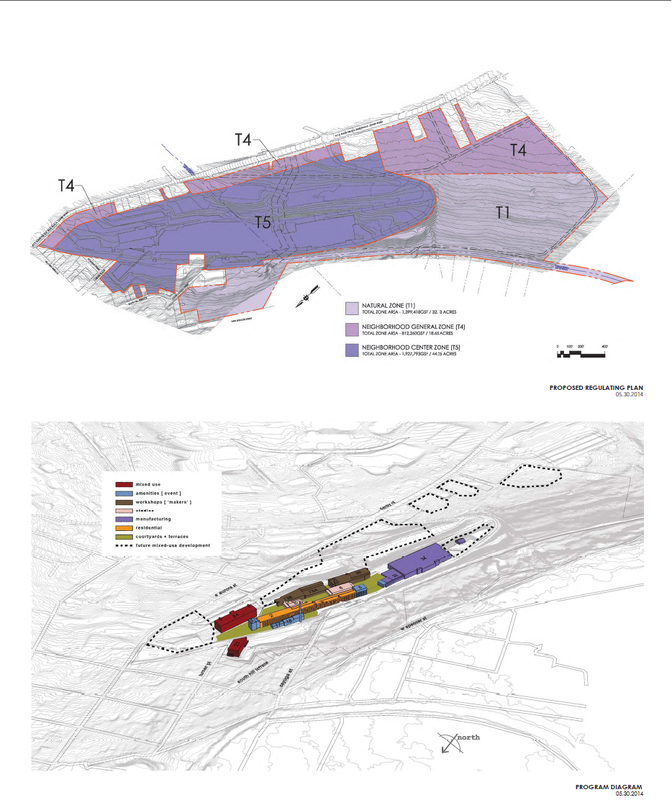 Full Environmental Assessment Form (FEAF) here, Site Plan Review (SPR) cover letter here, application here, drawings here. The cost of construction will be $5 million, and go from February 2015 to August 2016. 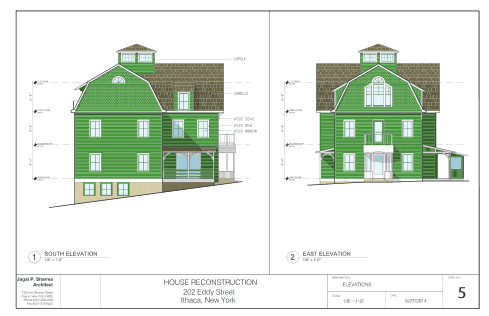 The drawings look nearly the same, some slight changes in the massing and more windows on the second floor’s northwest face. Lastly, 205 Dryden. The prison slit windows are gone from the west face, replaced with a cutout for windows on each floor. The slit windows remain on the east face. FEAF here, SPR cover letter here, application here, drawings here. Oddly enough, this one is also budgeting $5 million, and a Feb 2015 to August 2016 construction period. Being that they’re both by the same architect, I wonder if that’s correct, or if someone was just a little too liberal with the copy-and-paste. The building will be 65’0″, and have retail on the first floor and 10 4-bedroom units on the upper five floors. 1. 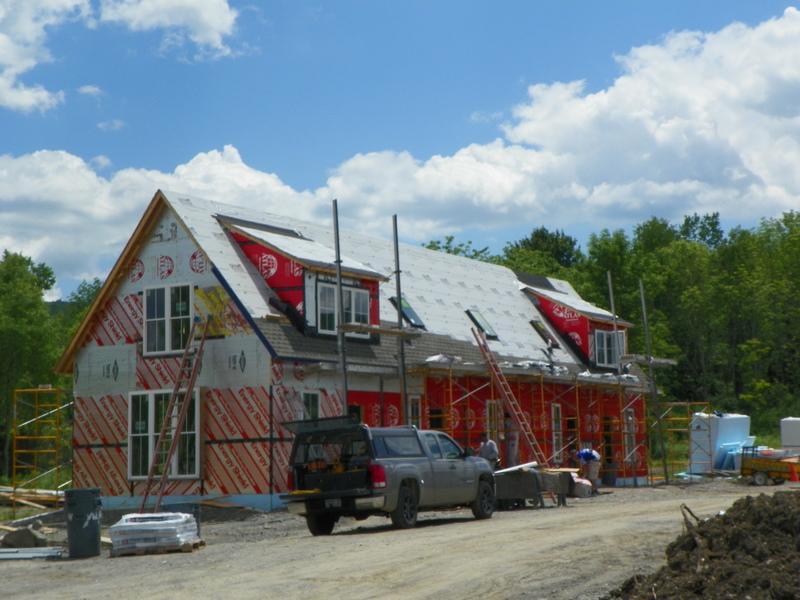 The rather suburban Troy Road development has begun the long road to obtaining construction approval, prodding the town of Ithaca to grant a planned development zone, or PDZ, so they can have leeway on the layout and variety of housing on the property. 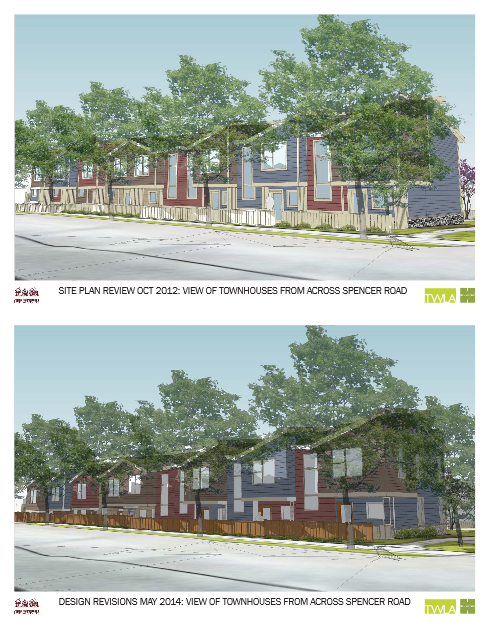 The proposed development has whittled itself down from 216 to 166 units, and gone are the 26 lots for the single-family homes (leaving 90 apartments, 60 town homes, and 16 patio homes; the developer indicates the apartments will be 1 and 2-bedroom and shooting for the middle-income bracket ($1,000/month), and the patio homes will be geared towards seniors). 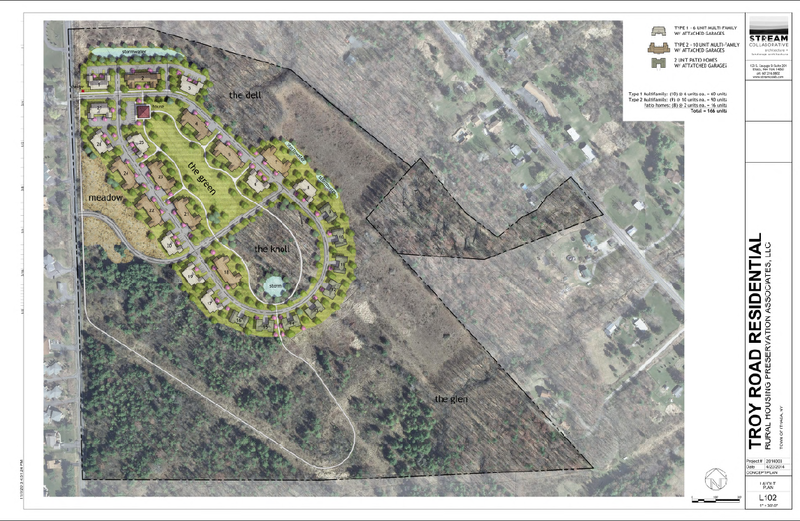 As with virtually every other project proposed in recent memory, this one has its share of opposition, for which the town board has some sharp words (the current zoning is actually worse, it allows for a sprawl-tastic 154 units spread out over the entire property). 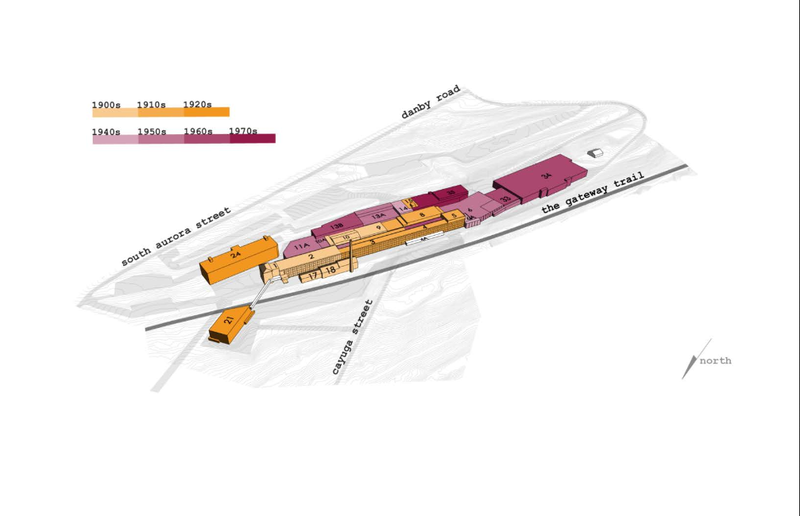 The 166 units would be clustered on 22 acres, just under one-third of the space. 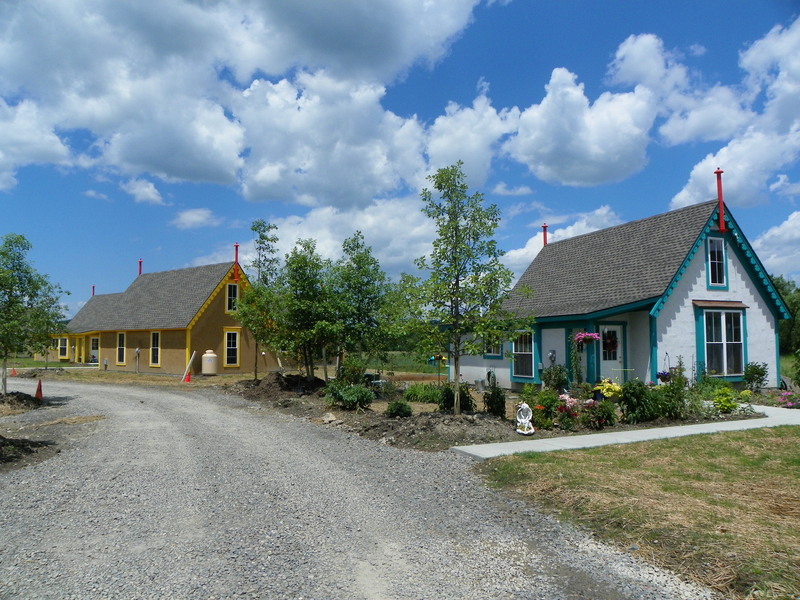 The developer (Rural Housing Preservation Associates) submitted a detailed market and traffic study to the town, and seems to be trying its darnedest to gain that PDZ. However, that requires 6 town board members to say yes, and only 4 felt so inclined at the June 9th meeting. Look for this one to continue to evolve over the summer. 2. Normally, I could care less about a single house. 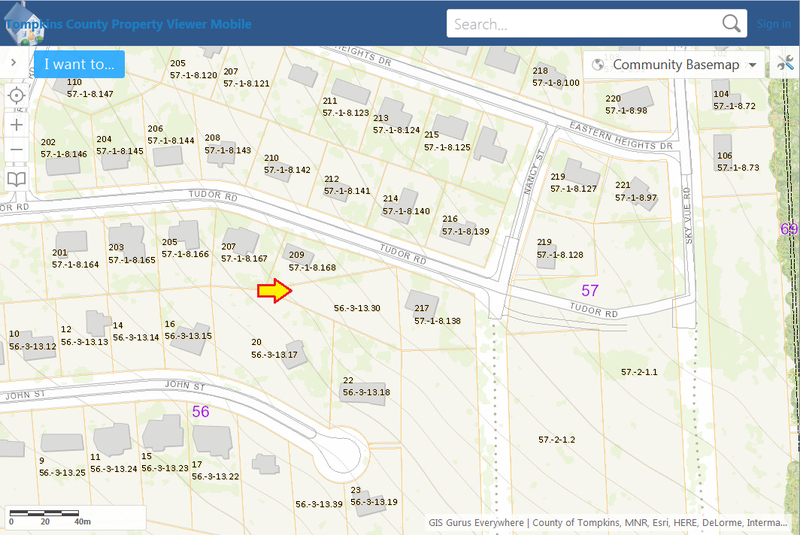 Looking at the map above, it seems the surveyor of this East Ithaca lot had a liquid lunch. The owners of 209 Tudor, who own the inaccessible lot, want to adjust the lot line so that both have a similar amount of road frontage, with the intent of selling off the extra lot for the construction of a new home. As things would have it, the neighbors were vociferously opposed. It was claimed that it would negatively impact the character of the neighborhood. The lot is surrounded by houses on adjacent lots. Sigh. 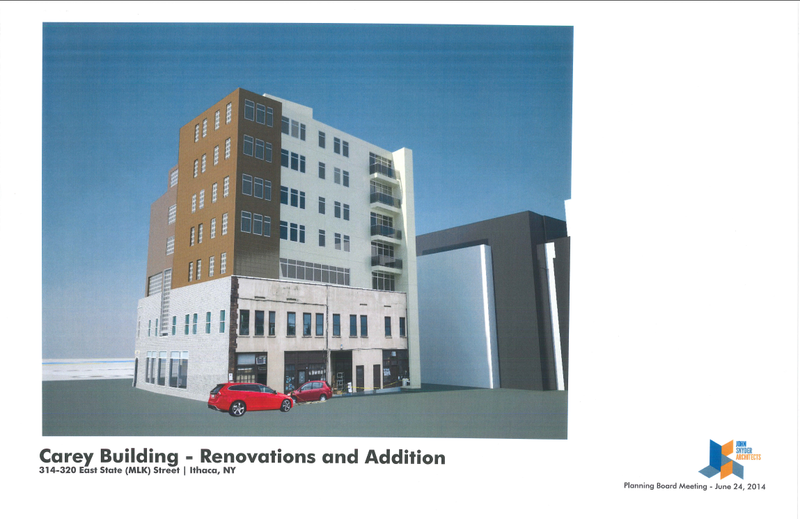 Since the complaints were more building issues than zoning issues, the ZBA approved the lot revision. The new lot is for sale for $55k. 3. Some readers might recall a house burning in Collegetown back in March. 202 Eddy’s destruction left 12 students homeless, and a historic structure in ruins. The developer vowed to rebuild, and according to these documents filed with the city’s ILPC, he looks to make good on his vow. 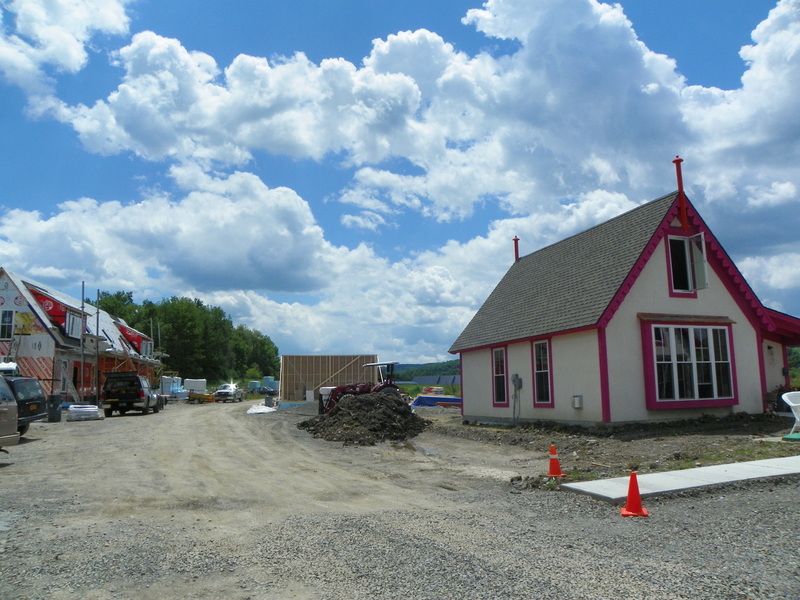 An entrance door will be repositioned, the emergency stairs will be gone, and a chimney will not be rebuilt, but otherwise, its a near-replica to the original. The architect-of-record is Jagat Sharma, who has previous experience from the reconstruction of Sigma Pi’s house when it burnt down in 1995. The ILPC has to approve this, so there could be some tweaks; but I doubt they’ll be significant. 4. There are 13 different PDFs detailing the Gannett expansion and the construction phases on the city’s website. I don’t even want to go through it all. In a nutshell – 22,400 sq ft of renovated current space, and 73,600 sq ft of new space. 175 construction jobs, and Gannett expects to add 40 new permanent jobs, mostly physicians, counselors, and related personnel. Projected construction cost will be $25.5 million, and go from March 2015 to October 2017. 5. Has 7 Ridgewood really been through six different designs? Holy Christmas.